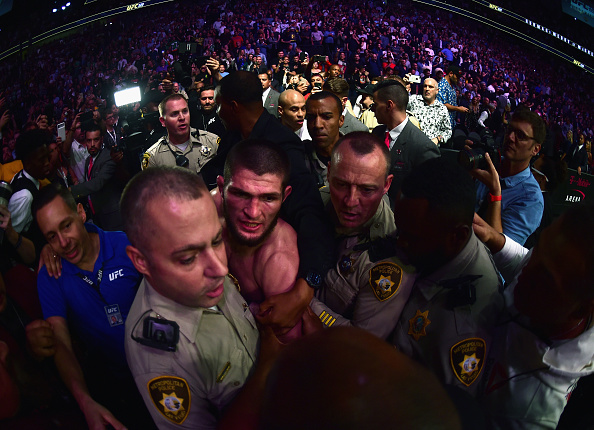 The Nevada State Athletic Commission announced the suspensions and fines for UFC Lightweight Champion Khabib Nurmagomedov and Conor McGregor yesterday afternoon, stemming from the post-fight brawl at UFC 229. McGregor received a six-month suspension, retroactive to October 6, as well as a $50,000 fine, while Khabib was issued a nine-month ban and a $500,000 fine. However, Khabib's suspension can be reduced to six months if he participates in an anti-bullying PSA. Conor took to social media in the early hours of Wednesday morning to voice his opinion of the NSAC's ruling, which he described as a "fair assessment and handling of the brawl incident." Naturally, he also took some jabs at Khabib's camp and gave a quick play-by-play of "the final blow of the night on my opponent’s blood relative." McGregor's first tweet on the matter reads: "I am thankful for the Nevada athletic commissions fair assessment and handling of the brawl incident. It was not my intention to land the final blow of the night on my opponent’s blood relative. It’s just how it played out. I look forward to competing again soon. Thank you all." His second tweet contained screenshots of "the final blow," along with the following: "Straight left hand inside the attackers jab. He attempted to use the big security guard that’s in all the movies as cover, but I could smell him a mile away and landed flush down the pipe. The final blow of the night UFC 229 in association with McGregor Sports and Entertainment." McGregor will be eligible to return to the octagon as soon as April 6, just a week before the UFC 236 PPV on April 13. He and Donald "Cowboy" Cerrone have been teasing a bout for weeks, but there are no shortage of opponents looking for a big payday against the Irish superstar.